I was really disappointed in those custard wafer cookies. I had to find something that had a better custard/pudding flavor. Maybe these ice bars will do the trick! This box has a simple design. 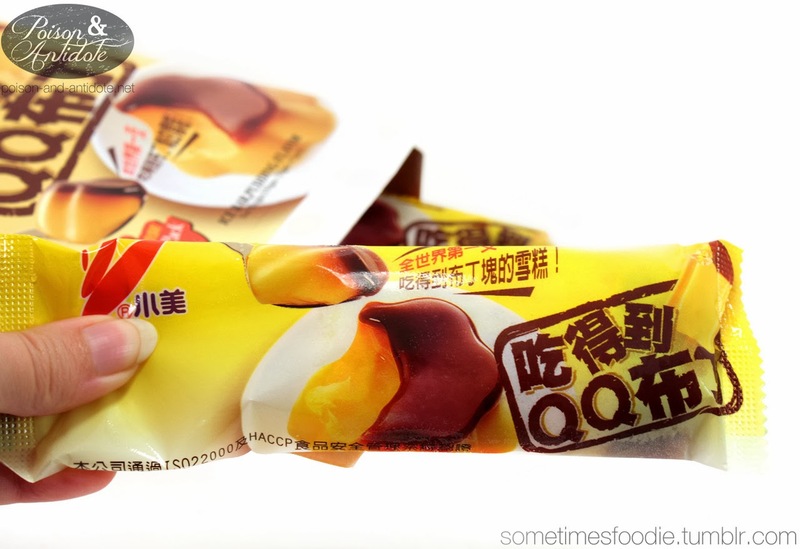 (Especially when compared to the custard cookie packaging.) The whole box is a soft custard color with dark brown and red text. I really like the simplicity and limited color palette. 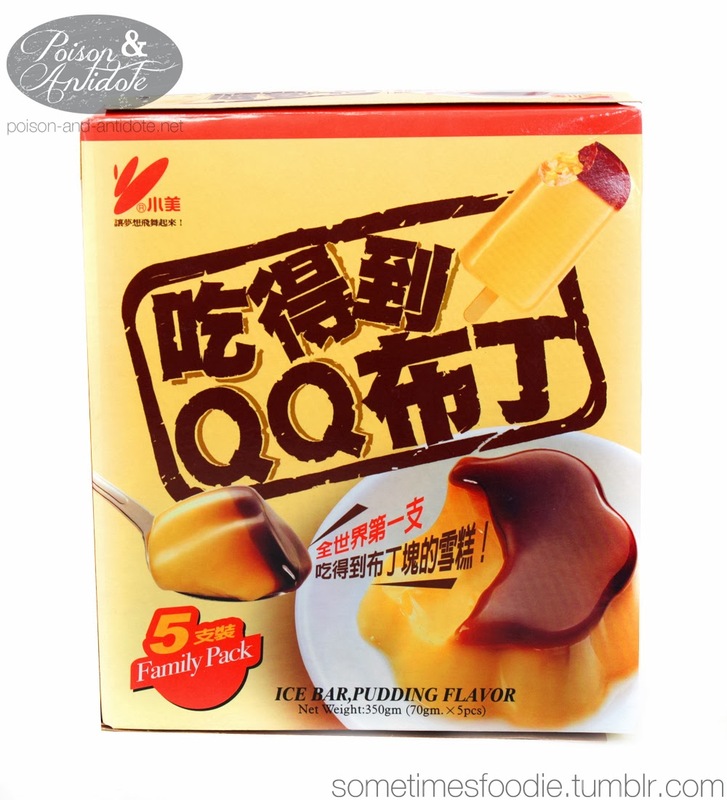 It features photos of the popsicle and a standard pudding with caramel topping. The bars inside are wrapped in a bright yellow plastic. I like the consistency throughout all the packaging. 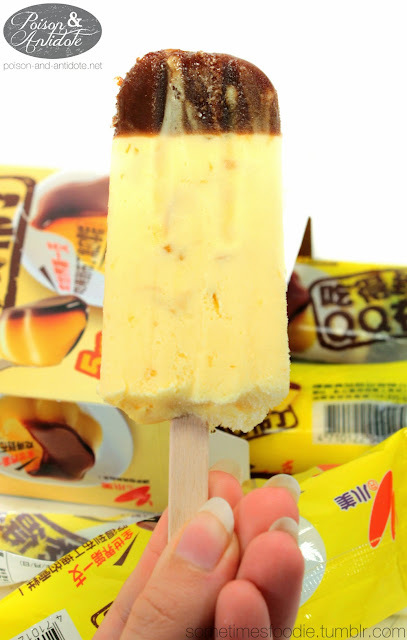 Inside, the ice bar is custard-colored with little yellow jelly-bits throughout. The top of the bar is brown just like the traditional caramel topping on most custards or flan. Does it taste like pudding? YES! The custard-colored frozen confection has a nice, warm, vanilla flavor. When that is combined with the little translucent jelly-bits, it mimics the bouncy texture of real custard! The caramel topping, was more coffee than caramel. It had a strong, bitter, taste like black coffee. It mixed well with the pudding flavor, but alone it was a little too bitter for me. Thankfully the popsicles weren’t a bust like those wafer rolls. These are yummy, texturally interesting, AND visually appealing.